Mabel “June” Larson, age 92, of Cheboygan, died on Thursday January 10, 2019 at Hospice House in Cheboygan. A longtime resident of East Tawas, June moved to the Cheboygan area in 2010. Born in New Greenleaf, Michigan on May 4, 1926, she was the daughter of William and Anna (Kniubas) Powell. June married Robert E. Larson on January 24, 1948 in Romeo, Michigan. June was a wonderful homemaker who enjoyed sewing, knitting, quilting, and ceramics. Always thinking of her family, she made special quilts for each of her grandchildren and great grandchildren. She sewed placemats and crocheted dishcloths and Kleenex box covers that she gave to the nursing staff that took care of her husband, the mailman, friends from church, and anyone who stopped by. She loved feeding the birds and peacefully watching them as they came to her feeders. As a young family, June, Bob, and their children enjoyed family camping trips and spending time at the lake. She was a wonderful hostess and loved having company and entertaining. June and Bob enjoyed traveling and for many years spent their winters in Florida where they often joined June’s brothers and sister for dinner. 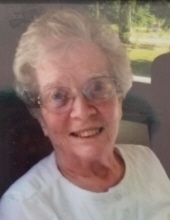 June enjoyed close relationships with her family and treasured spending time with them. Kind-hearted, she found joy in helping others and was appreciative of any small act of kindness shown to her. She had a strong Christian faith and through the years and the many places she lived, always made wonderful friends wherever she worshipped. June was a member at the Church of the Nazarene in East Tawas for many years. Surviving June is her daughter, Rita (Ron) Duman of Topinabee; son, Edward (Lizeth) Larson of Tennessee; as well as eight grandchildren and nine great grandchildren. She was preceded in death by her husband; sister, Edith Bishop; and brothers, Henry, Ray, and Lee Powell. Cremation arrangements were in care of the Chagnon Funeral Home. A memorial service will be held in the spring. Those planning an expression of sympathy please consider a donation in memory of June to Cheboygan Hospice House, c/o McLaren Northern Michigan Foundation, 360 Connable Ave., Suite 3, Petoskey, MI 49770. To plant a tree in memory of Mabel "June" Larson, please visit our Tribute Store. Cremation has taken place. A memorial service will be held at a later date. "Email Address" would like to share the life celebration of Mabel "June" Larson. Click on the "link" to go to share a favorite memory or leave a condolence message for the family.